Last night at the Kitsap County Commissioners regular meeting board chairman Robert Gelder apologized for how things went down at the board’s April 9 meeting. I wasn’t at the meeting, but a review of the tape shows that a number of supporters of the Kitsap Rifle and Revolver Club attended the meeting to speak out during the board’s allotted public comment period. People were upset with the county for not inviting the KRRC to a meeting at the end of March that dealt with a proposed update to a shooting range ordinance. The ordinance would impact the county’s existing ranges by requiring them to apply for an operational permit and dictating their hours of operation, among other regulations. Apparently as people continued to line up to speak, Gelder announced no more public comment would be taken on the rifle range. He then adjourned the meeting. The scene was tense and it appears one woman was in the process of testifying when the meeting ended. On Monday Gelder apologized for how he handled the situation. “I want to extend to Mrs. Cooper, who was making comments at the time, an apology for potentially cutting you off and handling that poorly,” Gelder said. The board wants to provide a forum for the public to talk to commissioners and that didn’t happen April 9, Gelder said. While the public comment period is not a time for commissioners to interact with the audience, it is still a time when the public can be heard. Gelder wants the communication to remain respectful — from both directions, he said. “I am sorry that I did not show you that respect at that time,” Gelder said to Mrs. Cooper. (I don’t know whether she was in the audience of roughly 80 people at Monday’s meeting). Contrary to some opinions, commissioners are committed to seeing KRRC reopen and come into compliance under the county’s land-use code, the board said Monday. Gelder tried to convey that message following Monday’s public comment, where people blamed the commissioners for the lawsuit against the club saying it appeared the county had a vendetta against the facility and wouldn’t be happy until it was closed for good. Commissioner Josh Brown also commented about his reaction at the April 9 meeting, saying he was upset with a comment suggesting the commissioners only sold the club its land in 2009 so it could shut it down. He called the allegation ludicrous. Brown said the shooting range ordinance update the county is working on will allow the county’s existing gun ranges to continue operation in the future, while taking into account the concerns of the surrounding neighborhoods that have built up around the ranges. “I really believe we’re going to have a good document that the community can be proud of that’s going to balance these competing interests,” he said. I received information about an open house that will be held Tuesday in a newsletter released by Commissioner Josh Brown’s office. Those interested in meeting with Brown are welcome to attend his “Open Office Hours” Jan. 24 from 1 to 3 p.m. at the Silverdale Library, 3450 NW Carlton Street in Old Town Silverdale. According to a blurb from Brown’s office, he’ll make himself available to meet with citizens to hear their concerns and ideas and to talk with them about topics related to county government. He’ll be in the Hess meeting room of the library. People can just drop by, no appointment is necessary. For more information, call 360-337-7080. Comments on today’s story about the county’s Veterans and Human Services Levy, approved for the Nov. 8 ballot by the Kitsap County Board of Commissioners, indicate there is considerable lingering disgruntlement about the board’s decision in 2009 to defer collection of the the veterans assistance fund levy in 2010, a move made to help balance the county’s general fund budget. Please note that the fund that would be created if voters approve the special Veterans and Human Services Levy is separate from the county’s Veterans Assistance Fund, but because they both are aimed at helping veterans, people have connected the dots. Commissioners Josh Brown and Charlotte Garrido, who were on the board at the time, seemed at last night’s meeting well aware of the sense of mistrust and long memories of those who disagreed with that decision, the net result of which was $320,000 that did not go into the fund. Garrido and Brown commented more than once to that effect. I’ve attached a copy of the Veterans and Human Services Levy Resolution to the story (and put a link to it here). The document goes into considerable detail about how the money will be tracked and allocated. Revisions were made in response to public comments, said Leif Bentsen, who coordinates the county’s Veterans Assistance Program. Whether provisions of the resolution adequately provide for efficiency, transparency and effective use of the $1.4 million per year is open to debate between now and Nov. 8. Several readers also commented that they would prefer a sales tax over a property tax. Commissioner Rob Gelder got back to me today and reaffirmed what he said at the meeting. While state law allows for the county to collect sales taxes for a host of purposes, a human services levy is not among them. The closest the law comes to that is a provision for mental health funding, Gelder said. Here’s the entire document for those who can access it. Josh Brown, Lary Coppola trade accusations. Lange won’t be able to open this season after being a victim of what can only be called a classic flim-flam by county regulators. Meanwhile the Kitsap County Health District is requiring Lange to have a lifeguard at the pool, something he claims has never worked because parents would dump off their kids for long periods, with a lifeguard, while they always stayed and watched without one — and according to Lange, the kids behave better. The Health District also required Lange to install a second pool drain to supposedly prevent sucking swimmers down the drain, or some such nonsense, while an alternative solution he proposed was not acceptable. 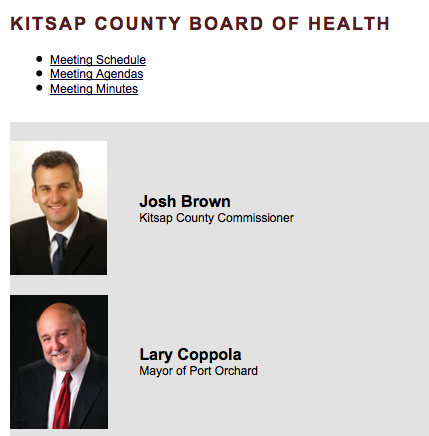 Brown points out in his response that Coppola actually sits on the Kitsap County Health District’s board of directors. Here’s the two of them together on the district’s website. I read your recent editorial in your newspaper blasting the Kitsap Health District policies over Lange’s Ranch. Your article attacks Kitsap County and our DCD. What you never clear up for your reader is that the regulations that Lange’s Ranch must clear are Health District policies—a board on which you sit! You have never brought this up to the Health District Board at a meeting, nor do I recall ever seeing any correspondence from you asking Health District staff to report back to you and the Board on this matter. This article continues your pattern of misrepresenting facts, attacking others when you take no responsibility, and just plain lying. I believe you owe the employees and Board of the Health District an apology. Also worth reading are some of the comments on the stories referenced earlier, the ones from our paper. The first story, the one warning of a “showdown,” begins mostly with those complaining along the same lines Coppola does in his piece, with some counterarguments from those saying government should regulate as it has here. After the second story, however, there appear to be a lot of folks who know Lange weighing in. Following publication of a story July 5 on a proposed property tax levy to aid Kitsap’s veterans and non-veteran homeless, I heard from Abby Burlingame, who challenged Kitsap County’s actions related to its Veterans Assistance Fund over the past two years. I did not ask that question as I interviewed Brown for the recent article. But in response to Burlingame’s questions, I called Brown last week and a got a few answers to some questions she raised. First, a little background. The county under state law collects and distributes money on behalf of indigent veterans. In the grand scheme of things, it’s not much, 1 and 1/8 cents per $1,000 of assessed value. But before 2006, the county didn’t have a systematic way of getting the money to veterans. That was done informally, through the local Veterans of Foreign Wars. “By 2005, over $1 million had accrued in the fund because it had been spending less than what it had been taking in,” said Leif Bentsen, who works for the county part-time coordinating the Veterans Assistance Program. The fund was then handled by the auditor’s office. In 2006 the board of county commissions assumed authority of the fund and turned the administration over to the department of personnel & human services. In December 2006, under the same state law, the Kitsap County Veterans Advisory Board was created. By 2009, as the recession was raging full blast, the veteran’s fund still was underspent. It had a balance of $900,000 and the program that year had a projected budget of about half that amount. The county technically didn’t “borrow” money from the fund, but state law allows local governments to lower the amount collected when the balance in the fund exceeds the total amount that could be collected, in this case, $320,000 in 2009. That’s because the county is limited as to how much it can raise taxes in any given year to 1 percent over the previous year (not counting new construction). The net effect, as Burlingame points out, was $320,000 less for the veterans fund and $320,000 more for the general fund. This February, Brown backed proposed legislation that would have separated the veterans fund levy from the general fund levy. The effect, said Brown and legislators who supported the bill, would be to eliminate competition between the two funds. With the veterans fund tax as a stand-alone, there would be no more of the push-me-pull-you syndrome. Money for veterans could be collected and the county could collect the equivalent $320,000, or whatever it would be in that year, for the general fund. And if you said that amounts to a tax increase, you are correct. Burlingame wanted to know why, if the veterans fund was so flush that the county could tap it in 2009, there is now a proposal on the table to implement a separate levy specifically for homeless vets and other homeless people. Revenue from the levy would be split 50/50 between vets and non-vets. Advisory boards for each group would make recommendations about allocation of funds. She also wanted to know, now that the veterans are apparently in such dire need, if the county intends to replenish the $320,000. So here are the questions I asked Brown, with his responses. – In 2009 the board eliminated collections to the Veterans Assistance Fund for one year. Do you feel any sense of responsibility for the fact that the county’s veterans assistance program expenses now exceed revenues? “I guess I don’t look at it that way,” said Brown, who elaborated at length about the context in which that decision was made. In the first place, said Brown, the Veterans Assistance Fund was being underutilized when he took office in 2007. Informal distribution through the VFW worked in previous years, but as new generations of soldiers returned home from service, they did not so much connect with that organization. The goal of county officials when Brown arrived was to get the funds out into circulation on behalf of vets. Brown didn’t claim credit for the effort, but he did support it. His own family has military ties, and he is a strong supporter of veterans, he said. “It’s been just a phenomenal success,” Brown said. “And today, we are helping many more vets than we did in the past. That’s one of the reasons the fund balance is down. County and local social service workers became better at identifying and connecting with veterans in need. “In a way we’re a bit of victims of our own success,” Brown said. “Sale tax revenues were dropping precipitously. We were dealing with a major financial crisis, not just as a nation but locally,” Brown said. The board weighed the fact that the veterans fund had nearly $1 million, for a budget of around $400,000, as compared to what had been whittled down to a $4 million reserve in the in the general fund balance. To put that in context, county general fund revenues in 2007, when Brown took office, were about $86 million, he said. They’re now down to $78 million, and the reserve fund has been built up to $7 million. In 2009, the board of commissioners was worried about exhausting its reserve fund. So they chose to use the veterans fund to help balance the budget. “This was not a decision the commissioners made lightly,” Brown said. – Now that the economy has more or less stabilized (if not recovered) why wouldn’t the board consider reimbursing the veterans fund, as Burlingame has suggested, for the amount it was unable to collect in 2009, about $320,000? Brown says that would be a stopgap measure. At the current rate of consumption, $320,000 would last about 8 months. “I concede there’d be 8 more months of funds,” Brown said, but he denies the action taken in 2009 caused the problems the fund is having today. Were the board to consider making the transfer, Brown said, it would force a choice between shoring up the veterans fund and cutting essential services, like law enforcement. In the long run, it would not solve the issue of sustainable funding for vets, Brown said. The vets levy, however, has been successful in King County and Brown thinks it could help address the sustainability problem here. Although not openly endorsing the proposal, Brown said, he’s open to discussing its merits, despite the fact it involves the dreaded “T” word. – The bill separating the veterans fund from the general fund would have prevented the board from making the budget shift in 2009. Earlier this year, you seemed to favor what you described as elimination of competition between the funds, and yet the law as it is helped you balance the budget in 2009. Can you comment on this apparent conflict? Brown reiterated his goal, and the goal of county veterans advocates, is to provide sustainable funding for veterans. The bill, which didn’t make it out of committee, would have helped do so by protecting the fund from fluctuations in the general fund. The bill would have allowed for a small — Brown emphasizes — tax increase, because the money now going to veterans would have been taken out of the general fund maximum in any given year, essential creating more taxing capacity. The impact to individual taxpayers would have been minimal, Brown said. For the owner of a $250,000 home, the 1 and 1/8 cents per $1,000 vets fund levy amounts to about $2.80 per year. Had the law passed, said Brown, he would have pushed — and still may — for a “council-matic” increase in the vets levy. Brown suggested a penny per $1,000 increase, or an additional $2.50 per year on the same $250,000 home. That would generate about $300,000, which would have a substantial impact on the fund, Brown said, adding it’s the least we can do for our vets. The race for the Kitsap County central district commissioner seat will be contested. Republican Abby Burlingame will challenge Josh Brown, Democrat, in his bid for re-election to the Kitsap County Board of Commissioners. Burlingame, 30, is a North Kitsap High School grad who lives in East Bremerton and has cut hair for the past decade at A Barber Shop in Silverdale. She also studied public policy and law at Seattle Pacific University and said she is one Spanish class shy of finishing her bachelor’s degree program. She interned during the 2009 Legislature for state Sen. Bob McCaslin, R-Spokane Valley and her name appears as a research assistant on papers prepared by the Washington Policy Center. Her chief interest in running stems from her belief in local government, she said. Burlingame said local governments will continue to feel the brunt of budget concerns in the coming years. She said she not certain the county is well positioned to handle the budget challenges ahead, given the projects the county has planned. Burlingame said she built a house when she was 23, a house she sold when she went through a divorce. She is single with no children.